Flight 1549 commemorate the 10th anniversary of the "Miracle on the Hudson." Congrats to the volunteers from our community partner MIRA USA who completed their disaster training in mass care! On Friday, we were back at Midwood High School providing emergency preparedness training. So proud of our amazing preparedness team who trained 3,000 students over two days. 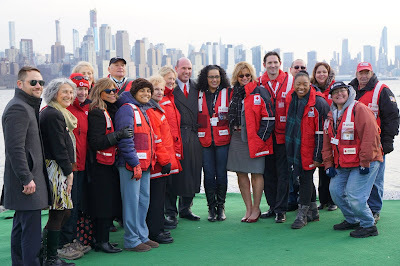 Great to see our very own Francisco Resto featured on the American Red Cross (national) blog. Resto is an 11-year veteran of the organization and currently serves as disaster responder working overnight shifts. Are you disaster ready? One of our resident preparedness experts, Jason Lyons, was asked to give some practical advice for the website, PreparationConcierge.com. On Tuesday, Councilman Justin Brannan joined our smoke alarm installation team to install free smoke alarms in his constituents’ homes and to raise awareness for our lifesaving Sound the Alarm program. Tuesday also marked the 10th anniversary of the ‘Mircale on the Hudson’ emergency landing. Dave Sanderson, one of 155 people aboard Flight 1549, brought together first responders, a ferry captain, nurses and Red Cross volunteers to say thank you for coming to his aid in 2009. On Monday, Metro New York North volunteers were on scene of a fire in Yonkers, alongside Yonkers OEM, opening a reception center at a nearby school. Red Cross providing emergency assistance to 17 adults and 11 children. We are actively recruiting for the following volunteer positions: Volunteer Screener, Home Fire Campaign Team Member, Disaster Action Team Member, Recruitment Support Member, Recovery Caseworker, Mass Care Team Member. Apply today at www.redcross.org/volunteer! For more information, please contact recruitmentgny@redcross.org. January is National Blood Donor Month and we are partnering with NYC Service to recruit volunteers to help #SaveLives at blood drives. Jan. 22, 25, 26, 28: Red Cross blood drives will take place from 2 to 7 p.m. at the Greater NY Red Cross building located at 520 West 49th Street, Manhattan. Schedule an appointment to donate today! Jan 26: The American Red Cross is heading to #Queens to install FREE smoke alarms and provide fire safety information to area residents. Sign up today for your FREE smoke alarm by calling 877-REDCROSS or visiting soundthealarm.org/NYC. Feb 18: We are holding a 2-hour class on the history of the Fundamental Principles of the Red Cross and Red Crescent Movement. The course will look at how these humanitarian princlples were developed based on the Movement’s experience responding to suffering over the previous century. Feb 19: Learn about the mission and vision of the American Red Cross and the many volunteer opportunities that are available for you in Westchester County and beyond. Join us in our Hawthrone, NY office to learn more!